Does your business have a clear data governance framework? Without data governance your business is exposed to risk when it comes to sharing data. Learn how your business can create new data governance structures that define the collection of useful data, ensure its secure storage and position it as a strategic asset. 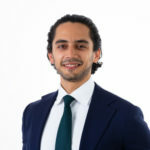 Nadir Husain is a Business Development Manager at Data Republic with over 8 years of experience in driving strong growth across financial and technology organizations. Today he works with some of Australia’s leading companies using data to drive growth and value with internal departments and external partners.